All members of INSOL Europe are entitled to the membership benefits of INSOL International. INSOL International is a world-wide federation of national associations of accountants and lawyers who specialise in turnaround and insolvency. There are currently over 44 Member Associations with over 10,000 professionals participating as members of INSOL International. Individuals who are not members of a member association join as individual members. INSOL International also has ancillary groups that represent the judiciary, regulators, lenders and academics. These groups play an invaluable role within INSOL International and provide valuable forums for discussions of mutual problems. INSOL International Press Releases are published here. INSOL International Reports are published here. 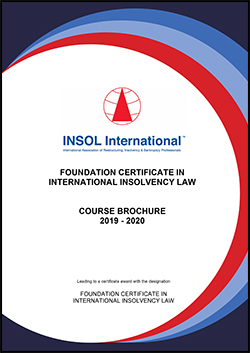 INSOL International is in the process of launching its new Foundation Certificate in International Insolvency Law, which commences on 1 September 2019. Enrolments on the course open on 1 March 2019. This course has been designed as an entry level course for persons who have no or very little experience in the field of international insolvency law, especially for persons in emerging markets and developing economies who may not have access to a similar course in their own jurisdictions. The Foundation Certificate is not to be confused with the Global Insolvency Practice Course (GIPC), which remains INSOL International’s flagship educational offering for persons with more than five years’ experience. While the course fee for both designated and non-designated countries has already been set very low for a course of this nature, please note that INSOL International members qualify for a 25% discount on the course fee. INSOL Europe members are also therefore eligible for this discount. Full details regarding the course, the entry criteria and the course fee can be found in the course brochure. If you have any questions regarding the content or presentation of the course, please do not hesitate to contact the Course Leader, David Burdette at david@insol.ision.co.uk.